We have those among us that believe in National Socialism. I content that socialism in any form is a radical and extremely dangerous political philosophy which inevitably leads to mass killings, starvation and slavery. Bolshevism, Communist doctrine based on the theories of Karl Marx as formulated by Lenin. These theories were outlined at the second congress of the Russian Social Democratic Labor Party held in London in 1903. The divergent viewpoints of the delegates to the congress crystallized into two factions, the more radical faction being led by Lenin. He advocated a unified party of active, professional revolutionary members, willing to use any means to establish a Communist society. His opponents, on the other hand, proposed to admit all who declared general sympathy with the aims of the party, regardless of active participation. On this point the congress supported the latter plan, but on other matters and in the final vote that elected the party leadership, the congress favored Lenin. The faction led by Lenin was thereupon called Bolshevik (from the Russian word for majority), and the opposition, Menshevik (from the Russian word for minority). The names clung, although the Bolsheviks were not always thereafter the dominant group in the Russian revolutionary movement. The essential differences between the Bolsheviks and the Mensheviks appeared more clearly in subsequent years, when an apparent agreement on a Marxist programthe overthrow of tsarism, the establishment of constitutional government, and, finally, the overthrow of capitalism and the establishment of a Communist societyresulted in wide variations in practice. The Bolsheviks supported the immediate objectives only insofar as they led in the direction of the final revolutionary aim. The Mensheviks, however, believing that Russia was not ready for revolution, placed the emphasis on reform, especially the establishment of constitutional government. Neither faction played a dominant role in the revolution that followed the defeat of Russia in the war with Japan in 1905. The workers` soviets (legislative bodies) were formed spontaneously, and Lenin failed at first to realize their importance. Leon Trotsky, who, as chairman of the Saint Petersburg Soviet, was the active leader of their revolution, was neither Bolshevik nor Menshevik, but stood between the two factions, striving to unite them. When, as a result of the revolution, a parliament, called the Duma, was established later in 1905, the Bolsheviks preferred at times to boycott it and at other times used it as a forum from which to agitate, whereas the Mensheviks hoped to build the strength of the anticzarists within it. As a result of increasing differences, a final split between the two factions occurred in 1912. Thereafter the two parties, together with others, competed for the leadership of the anticzarist revolution. The Bolsheviks used both legal and underground tactics to advance their program, building a membership, in accordance with Lenin`s original specifications, of about 45,000 by March 1917, and 240,000 by July of that year. The Bolsheviks opposed World War I as an imperialist conflict in which socialists should have no part, but the Mensheviks and Socialist Revolutionaries, placing national before class interests, supported and eventually attempted to take leadership in the Russian war effort. As a result of the collapse of the Russian armies and the growing awareness of the inefficiency of the government, a revolution broke out in February (March, New Style) 1917, resulting in the abdication of the tsar and the introduction of parliamentary government. The Provisional Government, which included Mensheviks, was charged by the Bolsheviks with an unwillingness to expand the revolution in the direction of socialism. The Bolsheviks undertook this task through the soviets of workers and soldiers. The Bolsheviks seized state power in October (November New Style) 1917. In 1918, under the new name of the Communist (Bolshevik) Party adopted from an earlier organization led by Marx, they began their career as the dominant, and later, by decree, the sole political organization in the USSR. The subsequent history of the theory and practice of bolshevism is indistinguishable from that of communism. History they don't teach you in school! As we saw in the previous article, Bolshevism was indeed responsible for millions upon millions of deaths around the globe. It spread through Asia and subtly and indirectly in America through the work of Jewish revolutionaries like Alexandra Kollontai and Louis Wirth. Some commentators have objected to the idea that Bolshevism has taken a different form and been reincarnated in Zionism, which I call neo-Bolshevism. Yet the evidence clearly indicates that this is the case. Keep in mind that the end result of Bolshevism is death by the millions, and the neo-Bolshevik movement is leading toward that goal. We will explore the formation of Israel in more details later this fall, but let us clearly take seriously what Israeli General Yitzak Pundak has said. Once again we will not drill on this point at this present time. Kollontai was appointed by Lenin and Wirth was a great admirer of Stalin. Wirth also ended up destroying the ethnic neighborhoods in major cities in America, and we will come back to this issue in the fall. Kollontai, under the leadership of Lenin, would work tirelessly to overthrow the Czar in Russia. Kollontai also said, “I hate marriage. It is an idiotic, meaningless life.” Since marriage was no longer an option, Kollontai plunged into sexual liberation, which in the end made her miserable. Moreover, if Kollontai hates marriage, it was inevitable, then, that Kollontai would later seek to destroy the family by revolutionary means. “Magdalena Hinojosa, a striking-looking single woman, is a senior associate vice-president at the University of Texas. She’s learned that her job makes men uneasy. So when they ask her what she does, she simply tells them she works at the university, in the admissions office. ‘You have to hide who you are, at the beginning, until that person is comfortable with you,’ she says. “Has women’s success come at the expense of men? I’m not about to argue that. Society is better off because women have far more opportunity and can make more contributions to the world. Millions of men are proud of their accomplished wives, and proud to be devoted fathers. Bolshevism did not have the technological advantage to spy upon virtually everyone around the globe. Zionism, Bolshevism’s ideological grandchild, has seized upon the latest technology to once again continue the work that its ideological grandparent has started more than fifty years ago. More recently, President Joachim Gauck of Germany said that Edward Snowden is a freedom fighter, but Gauck has declared that Germany will not shelter Snowden, which obviously is an indication that Gauck is a political coward. Gauck also insinuated that the NSA’s spying program is the antithesis of freedom and basic human rights, but Gauck is not prepared to fight against those who want to suppress freedom and human rights. Other countries such as China, Belgium, Canada, Switzerland, the United Kingdom, have all condemned the NSA’s covert activity, but not a single country wanted to challenge the powers that be. In other words, you cannot defy the Zionist matrix without being called an anti-Semite or something equally worse. Snowden of course is not the first whistleblower in history. But he is the first person to have the courage to leave his home, his lavish career and decent family, and even his precious life, in order to expose the neo-Bolshevik movement. “Hello. My name is Ed Snowden. A little over one month ago, I had family, a home in paradise, and I lived in great comfort. I also had the capability without any warrant to search for, seize, and read your communications. Anyone’s communications at any time. That is the power to change people’s fates. “It is also a serious violation of the law. The 4th and 5th Amendments to the Constitution of my country, Article 12 of the Universal Declaration of Human Rights, and numerous statutes and treaties forbid such systems of massive, pervasive surveillance. “While the US Constitution marks these programs as illegal, my government argues that secret court rulings, which the world is not permitted to see, somehow legitimize an illegal affair. These rulings simply corrupt the most basic notion of justice – that it must be seen to be done. The immoral cannot be made moral through the use of secret law. “Accordingly, I did what I believed right and began a campaign to correct this wrongdoing. I did not seek to enrich myself. I did not seek to sell US secrets. I did not partner with any foreign government to guarantee my safety. Instead, I took what I knew to the public, so what affects all of us can be discussed by all of us in the light of day, and I asked the world for justice. “That moral decision to tell the public about spying that affects all of us has been costly, but it was the right thing to do and I have no regrets. “Since that time, the government and intelligence services of the United States of America have attempted to make an example of me, a warning to all others who might speak out as I have. “I have been made stateless and hounded for my act of political expression. The United States Government has placed me on no-fly lists. It demanded Hong Kong return me outside of the framework of its laws, in direct violation of the principle of non-refoulement – the Law of Nations. “It has threatened with sanctions countries who would stand up for my human rights and the UN asylum system. It has even taken the unprecedented step of ordering military allies to ground a Latin American president’s plane in search for a political refugee. “The greatest fear that I have regarding the outcome for America of these disclosures is that nothing will change. People will see in the media all of these disclosures. They’ll know the lengths that the government is going to grant themselves powers unilaterally to create greater control over American society and global society. In other words, Bachman is implicitly saying that people like Sarah Palin and Bill O’Reilly are engaged in Islamic jihadists—and they have benefitted from Snowden’s revelation! As we saw in a previous article, Palin even used the word “Orwellian” to describe the current state of America. I’ll let Bachman quarrel with people in her own camp. “Provided you have not leaked information that would put in harms way any intelligence agent, I believe you have done the right thing in exposing what I regard as massive violation of the United States Constitution. “Having served in the United States Senate for twelve years as a member of the Foreign Relations Committee, the Armed Services Committee and the Judiciary Committee, I think I have a good grounding to reach my conclusion. “I wish you well in your efforts to secure asylum and encourage you to persevere. “Thank you for your words of support. I only wish more of our lawmakers shared your principles – the actions I’ve taken would not have been necessary. “The media has distorted my actions and intentions to distract from the substance of Constitutional violations and instead focus on personalities. It seems they believe every modern narrative requires a bad guy. Perhaps it does. Perhaps, in such times, loving one’s country means being hated by its government. “If history proves that be so, I will not shy from that hatred. I will not hesitate to wear those charges of villainy for the rest of my life as a civic duty, allowing those governing few who dared not do so themselves to use me as an excuse to right these wrongs. “My intention, which I outlined when this began, is to inform the public as to that which is done in their name and that which is done against them. I remain committed to that. Though reporters and officials may never believe it, I have not provided any information that would harm our people – agent or not – and I have no intention to do so. “Further, no intelligence service – not even our own – has the capacity to compromise the secrets I continue to protect. While it has not been reported in the media, one of my specializations was to teach our people at DIA how to keep such information from being compromised even in the highest threat counter-intelligence environments (i.e. China). “You may rest easy knowing I cannot be coerced into revealing that information, even under torture. “One of the worst myths Democratic partisans love to tell themselves – and everyone else – is that the GOP refuses to support President Obama no matter what he does. Like its close cousin – the massively deceitful inside-DC grievance that the two parties refuse to cooperate on anything – it’s hard to overstate how false this Democratic myth is. “When it comes to foreign policy, war, assassinations, drones, surveillance, secrecy, and civil liberties, President Obama’s most stalwart, enthusiastic defenders are often found among the most radical precincts of the Republican Party. “The rabidly pro-war and anti-Muslim GOP former Chairman of the House Homeland Security Committee, Peter King, has repeatedly lavished Obama with all sorts of praise and support for his policies in those areas. The Obama White House frequently needs, and receives, large amounts of GOP Congressional support to have its measures enacted or bills its dislikes defeated. Max Boot of the same magazine propounded similar ideas.But who are those Islamist terrorists? The American people? the Syrian rebels? Al-Nusra Front? The Mujahadeen? Neo-Bolsheviks like Tobin and Boot do not care to give us a list of those terrorists because it is a fiction of their imagination. In a nutshell, the Obama administration will continue to use billions of dollars of taxpayers’ money to fund an Israeli-run program in order to spy on virtually every American. “The U.S. government has demanded that major Internet companies divulge users’ stored passwords, according to two industry sources familiar with these orders, which represent an escalation in surveillance techniques that has not previously been disclosed. “If the government is able to determine a person’s password, which is typically stored in encrypted form, the credential could be used to log in to an account to peruse confidential correspondence or even impersonate the user. Obtaining it also would aid in deciphering encrypted devices in situations where passwords are reused. Google in particular has been involved in this business for a long time. For example, in 2010, the Daily Mail reported, “Google was accused of spying on households…after it admitted secretly copying passwords and private emails from home computers. The people who are largely behind this movement are again NSA officials, and NSA officials largely take their orders from the Israelis and the neo-Bolsheviks. How else would they support the NSA’s covert activity? Who Killed the U.S. Economy? So why doesn’t Mr. President get serious and start rethinking about sending billions of dollars to a neo-Bolshevik state in the Middle East? How would you like to know that U.S. officials are shaking hands with terrorists and wish them well? How would you like to know that the American taxpayers put our politicians in office to play dice with jihadists? And how would you like to know that the Syrian jihadists have given our elected officials orders? Suppose that Jonas E. Alexis met with Al-Qaeda in South Korea and declared that he had a “constructive” dialogue with him. Instantly you should rightly say that Alexis needs to be arrested for associating with a terrorist. Yet in a neo-Bolshevik/Zionist world, Kerry can get away with praising terrorists. The U.S. can even send weapons to pro-Assad militias and Jihadists at the same time, but nothing will happen because the American people are sleeping. Al-Jarba wants America to know that the Syrian rebels/terrorists condemn all terrorism! Does Al-Jarba want us to believe that Al-Nusra Front is just a harmless group that fights for freedom and nothing else? We all know by now that the group is an Al-Qaeda associate. The situation got even worse by the December 2012 when the Syrian rebels tried to storm two predominantly Christian towns and tell the communities to either rise against Assad’s forces or face attack. And by the end of the same month, it was reported that the rebels were beheading Christians and feeding them to dogs. In the same month, the New York Times declared that Al Qaeda and other Jihadists had “an explicit stamp of approval” from the Syrian rebel. December 2012 seemed to have been a terrible month for the so-called war on terror proponents, since it was proved that Al Qaeda terrorists were indeed the main force behind the Syrian rebels. Moreover, it was estimated that almost 1 in 10 Syrian rebels were terrorists by the State Department itself! During the same month, it was widely reported that the Obama administration continued to secretly support the Syrian rebels from Qatar. During the same month, U.S. troops were around the Turkey’s Syrian border. It was reported that Qatar has given the rebels/terrorists at least $3 billion. At the same time, the United States was saying that major factions in the Syrian Rebels were terrorists because they were jihadists beheading prisoners. At the beginning of December 2012, the rebels smashed a school in Syria which took the lives of 28 children. So Al-Jarba is dead wrong—on purpose. The rebels/terrorists performed public executions of prisoners, and torturing prisoners on a massive scale is one of their main goals. Even cannibalism is not exempt from their ideological goal. At least one rebel cut the heart out of one dead body and took a bite. More recently, the rebels executed 50 Syrian soldiers. Yet this has never given the neo-Bolshevik/Zionist regime both in Israel and America a second thought. They want to shake hands with those terrorists and support them. Who’s paying the bill? Certainly not those elected officials or Obama. It is the average American. Keep in mind that the average college graduate will pay at least $30,000 for a bachelor’s degree in 2013. In other words, America has to give her last drop of blood for the neo-Bolshevik ideology and for the state of Israel and for terrorist groups like the Syrian rebels. While we give Israel at least $3 billion every year, Netanyahu can spend “$127,000 in public funds for a special sleeping cabin on a recent five-hour flight to London,” and this is just what we know about. Communism is not Bolshevism. In Bolshevik Russia, there is no common ownership of land, goods and money; nor is there equal pay for all. These two utterly impracticable ideals have, under the name Communism, been the means through which the Russian people have been duped into accepting something quite different, i.e., Bolshevism. It is State Capitalism, run by Jews in the Jewish interests. The Jews being a non-creative and unproductive nation have failed utterly in the grand farce of the Five-Year-Plan, because it was never in them to create but only to exploit what has been created by the work of others; in this case, they tried to create, and of course, failed. The seemingly strange predilection for Bolshevism which is notice*able in unexpected places in Britain to-day, is explained at once when it is realized that Bolshevism is a Jewish weapon; for the idea of Com*munism which prepares the “underdog” for Bolshevism, is backed by the Jewish Money Power itself, the existence of which as a political power is now becoming known even to the most unsuspecting Briton. Surely, no higher authority is possible; what was true in 1852 is true to-day. The first victim was Russia. The reason she was chosen was that she was the only country which defended herself by laws framed to prevent the Jew from contaminating and controlling her. Bolshevism is revenge on the part of the Jewish nation on Russia, actuated by Asiatic hate and tyranny. The Jews, chose their ground well. The Slav is by nature not individualistic; he is patient, inured to hardship and fatalistic. He accepted the idea of Communism; and he got the fact of Bolshevism. He accepted the idea of equal wages for all and property held in common; and he got a toll of 20 million lives, double the blood-bill of the Great War, as the price of his own starvation and slavery under Jews. The office of the Banking House M. Warburg has opened in accord*ance with telegram from president of Rheinish-Westphalian Syndicate an account for the undertaking of Comrade Trotsky. The attorney (agent) purchased arms and has organised their transportation and delivery up to Luleo & Varde. Name to the office of Essen & Son in Luleo, receivers, and a person authorised to receive the money demanded by Comrade Trotsky. This proves the Bolshevik connections of the Jew Banker, Max Warburg, brother of Paul Warburg, of Kuhn Loeb & Co., New York, who was the brother-in-law of Jacob Schiff, the head of that all-Jewish firm, who hated Russia so virulently that he would not render the Allies any help in raising loans, until Russia was out of the war. If any further proof of the interworking of Jewish finance with the Bolsheviks is needed, the case of the Bolshevik non-Jew Krassin (married to a Jewess), can be cited. Krassin had been involved in a revolutionary plot in 1907; he was then employed by Siemens Schuckert which is affiliated to the A.E.G., the big electrical combine, of which the Jew Rathenau was President. In 1909, Krassin became director of the St. Petersburg Branch. In 1917, he was in Stockholm with the Jew Furstenberg (signatory of the letter quoted above) and travelled with him to Berlin, and when the Bolshevik Revolution broke out, he took up his old job with Siemens Schuckert, whilst at the same time, Lenin placed him at the head of five Soviet Government Departments, including transport and food supply. The intermingling of this Soviet official with Jewish financiers outside Russia is thus proved up to the hilt. So highly did the Soviet Government prize the assistance of Kuhn Loeb & Co., the Jewish Bankers of New York, that they gave royal welcomes to the super-capitalist representatives of that firm when Felix Warburg visited Russia in 1927, and Mrs. Otto Kahn in 1931. The alliance of Jewish Finance with Bolshevism was as complete as it was when Disraeli wrote in 1852, as above quoted. Not only was this Bolshevik Jew, then, “in close co-operation” with rich Jews, but he had acted as a brake upon Russian production of gold to maintain the virtual monopoly of production of that metal under their control. BOLSHEVISM HAS THE SYMPATHY OF JEWRY. THE TREATMENT OF JEWS IN BOLSHEVIK RUSSIA. In Russia, “anti-semitism” is a crime punishable by death. All that is because Bolshevism is Jewish. The Jews, trying to prevent the recognition of this elementary fact, have from time to time published false stories about the hardships endured by the Jews at the hands of the Soviet. Chief Rabbi Gluskin and five other Rabbis, however, denied these tales in an appeal to Jews throughout the world not to support foreign agitation against the Soviet Government of Russia; this appeal was published at Moscow, on 27th February, 1930, and contained the following statements:—“The Soviet Government is the only one conducting an open fight against anti-semitism”; “it abolished the shameful laws which limited Jewish rights.” The reader is reminded of the Christian persecutions in Russia under the Soviet. Huge areas in the Crimea and Biro Bidjan have been allotted for exclusive settlement by Jews; these new “Homes for the Jews” have been failures, because the Jew cannot work; but, nevertheless, the intention of the Soviet is clear. The Jews have been specially favoured. 1n February, 1932, the Jew I. Montagu spoke in Manchester on “Russia” under the auspices of the “Friends of Soviet Russia.” He stated that the alleged oppression of the Jews there by the Soviet was an offensive lie. The Soviet had liberated all Jews from the disabilities imposed under the Tsar. Again, speaking before the Jewish Literary Society, 14th October, 1934, he said that Jews were given priority in employment on new works in the Soviet Union. Every Russian soldier under the Soviet, bears upon his cap the Jewish symbol of control, the five-pointed star. The same emblem has now replaced the double-headed eagles on the pinnacles of the towers of the Kremlin at Moscow. THE JEWS OF THE SOVIET GOVERNMENT. The Secret Council of War of the Bolsheviks, October 1917, con*sisted of seven Jews and five others, and the Jew Sverdlov presided over it. The “others” included Lenin, whose origin is doubtful although Russian authorities consider him to be a Jew. Among the best-known Jews of the Soviet Government were Sverdlov, Trotsky, Kamenev, Sokolnikoff, Uritsky, Litvinoff, Zinoviev, Radek and Kaganovitch. Stalin's wife is a Jewess. In no Department of Government was the proportion of Jews less than 76 per cent., and generally it was much more. This state of things has continued until 1938; Foreign Affairs, Agriculture, Commerce, Traffic Control, Food (i.e., the absence of it), and Finance, were entirely under Jewish mis-management. At the time of writing (Feb. 1939) it is evident that a gradual change is taking place; a large number of Jewish officials have been “liquidated” (executed) and the situation is obscure; the Jew Litvinoff remains at the Foreign Office and the Jew Kaganovitch (Stalin's father-in-law) at Stalin's right-hand. Meanwhile it is obvious that the Red Army has deteriorate to the extent that it can no longer be regarded seriously as a fighting-force. However, there are plenty of Jewish officials working up front below. The representatives of the Soviet Government abroad are always Jews; we in Britain have been treated to a succession of these Jews, and at the time of writing the Soviet Ambassador is the Jew Maiski. (1939). As the Daily Telegraph remarked on 9th April, 1937:—“Since M. Litvinoff ousted Chicherin, no Russian has ever held a high post in the Commissariat for Foreign Affairs.” The newspaper seems to he unaware that, according to the late Russian General Netchvolodow, Chicherin's mother was a Jewess! When the Soviet Government ceases to be Jewish, it will cease to be Bolshevik! How is it then, that this plain fact has not been generally known to the British public? Because the Jews have the money to suppress the truth, as they are doing to-day (1939) about Hitler in Germany. (1) A British Government White Paper, entitled “Russia. No. 1. 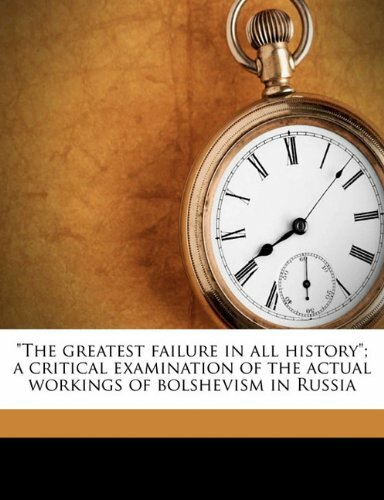 A Collection of Reports on Bolshevism in Russia,” was published in April, 1919. This contained a Report from M. Oudendyk, the Netherlands Minister at Petrograd during the Bolshevik revolution. This report was dated 6th September, 1918, and was sent by M. Oudendyk to our Minister in Norway, Sir M. Findlay, who passed it on to Mr. Balfour. The report contained these words:—“I consider that the immediate suppression of Bolshevism is the greatest issue now before the world, not even excluding the War, which is still raging, and unless as above stated, Bolshevism is nipped in the bud immediately, it is bound to spread in one form or another over Europe and the whole world, as it is organised and worked by Jews who have no nationality, and whose one object is to destroy for their own ends the existing order of things.” (Our Italics). So the Foreign Office knew in 1918 that Bolshevism is Jewish; M. Oudendyk at the time of writing his report was acting officially for the protection of British interests, as our own man had been murdered by the Bolsheviks. But that is not the whole story. There is more. This White Paper speedily became unobtainable; and an abridged edition wits issued in which the passage above quoted, but very little else, was eliminated from the Netherlands Minister's Report. Photo*stats of the page in question can be supplied to order from the I.F.L. at 2s. 6d. post free. BOLSHEVISM WAS JEWISH IN GERMANY. In the German Marxist Revolutions of 1918, the Jews were the directors and strategists; the Soviet Republic of Munich was led by the Jews Liebknecht, Luxembourg and Eisner; the German Cabinet was dominated by the Jews Haase and Landsberg, assisted by the Jews Kautski, Alzech, Kohn and Hertzfeld, with the Jews Schiffer and Bernstein in charge of Finance, and the Jews Preuss and Freund occupying the Secretariat of the Interior. In Prussia, the Ministry of Justice was all Jewish, headed by Rosenfeld; the Interior and Finance Ministries were held respectively by the Jews Hirsch and Simm. In Saxony, the leading lights of the Government were the Jews Lipinski and Schwartz; in Wurttemberg, the Jews Talheimer and Heimann; in Hesse, the Jew Fulda. The Jew Kurt Eisner boasted that he and ten other Jews had made the revolution; Lowenberg, Rosenfeld, Wollheim, Rothschild, Arnold, Kranold, Rosenhek, Birenbaum, Reis and Kaiser. The chiefs of Police of Berlin, Frankfort, Munich and Essen, and the heads of most of the Soldiers' and Workmen's Councils were Jews. That is why Hitler cleanses Germany of Jews; but you cannot learn that from our Jew-controlled Press. BOLSHEVISM WAS JEWISH IN HUNGARY. The Hungarian Bolshevik Revolution, too, was Jewish. There were only 1½ million Jews in the population of 22 millions, but 18 out of the 26 Commissaries of the Soviet Government in Hungary were Jews. Bela Kun (Cohen) was the Jewish beast who led them. BOLSHEVISM WAS JEWISH IN CHINA. The Chinaman is not built for “Communism.” The brigandage which masqueraded under the name of Communism in China, was run from Moscow and the principal agents were the Jews Borodin and Abraham Cohen. Japan will stamp it out; that is why the Jew-run Press of the world does all it can to discredit Japan in the minds of its readers. BOLSHEVISM IS JEWISH IN SPAIN. ALWAYS, JEWISH MASONRY HAS PREPARED THE DEBACLE. That is why Hungary, Italy, Germany, Portugal, Turkey, Poland and other countries have stamped out Masonry. See our pamphlets,Freemasonry(3½d. post free) and The Growing Menace of Freemasonry (4½d. post free). Bolshevism is Jewish. Its object is to gain world control for Jews, through the combined and allied forces of Jewish Finance and Jewish Marxism. In Russia, revenge has been the moving factor. THE words, Liberty, Equality, Fraternity which are sometimes summed up in the word “Liberalism” have a noble sound and appearance. Are they not above criticism? Yes, but only when each one is in its right place: Liberty where Liberty can be exercised with intelligence, Equality where Equality really exists, and so on. And yet, in the domain of politics these words are, as will be shown in the course of this Note, anathema to anyone acquainted with their origin and with the evil purpose to which they have been applied, and with the results of their use. The main result of their use has been the splitting up of coun*tries into warring political parties. These parties are known collectively as Democracy. When Democracy holds an election, it is supposed to produce—at least we flatter ourselves that it produces—a Parliament which represents the best interests of the State. But as the majority of members are forced by their political Association to put the interests of party before that of the State, Democracy fails at the very outset to achieve its main object. So it just carries on in a disjointed manner, in a state of political warfare with itself. After each allotted span of Parliament's life there is a new election. And then we may find that what the State thought was good policy during the last five years was all wrong; at least the new Parliament says so, and proceeds to put things “right.” It seems curious that the State did not know that for five years it was following a wrong course, when it did what the previous Parliament told it to do. The explanation, of course, is that the State is not the custodian of its own mind; it has handed its mind over to Democracy. The State, in fact, throws itself into the melting pot at short recurring intervals, and proves by the condition in which it emerges therefrom that it has no body or consistency of its own, no essential principles, and that it is for ever at war with itself. What are we to say of such a State? That it is no State at all. At the very moment of writing these words, an apt illustration of their truth has presented itself. An election has just taken place in which the issue before the electors was “For the Treaty” or “Against the Treaty,” that is to say, for honouring the country's bond or dishonouring it. The fact that the party for dishonouring the bond has prevailed is not to our point; at the next election the position may be reversed. We are concerned with the position of the State as illustrated by these facts. Where does the State come in? Where does it materialise? The answer is “Nowhere.” When Democracy came in at the door, the State flew out at the window. Paradoxical as it may seem, when the part came in at the door, the whole flew out at the window. How are we to put the State back into its place, not only in Britain but in every country that has any respect for itself? Has this ever been done? Yes, in Italy. This is not going to be a “pro*paganda” in favour of Italian Fascism, but that is no reason why we should not enquire how Italy managed to achieve the object which we are now seeking. But you may feel inclined to say that Russia also has achieved the non‑party ideal. No; although there is a body of men exercising supreme control over that country without the use of Parties, they are international revolutionaries, many of them of foreign race, who control their subjects by means of terrorism. Their chief aim is world revolution and they are using Russia as a base for interfering in the affairs of every civilised nation. The State controlled by them cannot be called a State in the ordinary sense of the word. So we will return to Italy. and enquire how it managed to transform a country governed by Party into a country governed by itself—that is to say, by the State. What happened was that under the ignorant and futile Party Government of Italy in 1918, the Inter*national Communists, supported by Moscow money, were bringing to a head a long course of peaceful penetration of Italy's industrial institutions, and were preparing, indeed they had started, revolution. A group of patriots, calling themselves Fascists, were aware of the danger, and, being also aware of the rottenness, the do‑nothing*ness of their own Government, prepared to oppose Communism by force and to save Italy. As events turned out, they were called upon to do a lot of fighting and to sacrifice many lives. But they had their reward; they were acclaimed the Saviours of Italy and became the originators of the new régime which has now made the State supreme in Italy. They resolved that there should be no more of that ridiculous form of Government by Party which has wrecked and continues to wreck the body‑politic of many countries which in their ignorance and stupidity still adhere to it. How can that knowledge be obtained? How did the Italians obtain it? By simple commonsense observation of what was going on around them. It is open to the people of all other countries sim*ilarly situated to obtain that same knowledge by the exercise of that same commonsense observation; it does not require any superhuman effort; just a little opening of the eyes and sharpening of the powers of observation. Then it is possible for the people of other nations to see what the observing Italians saw. And what did they see? All the subversive movements for destroying the existing order of things carried out by the agency of Socialists and Communists; the fomenting of interminable strife between the sections of the Com*munity who ought to be co‑operating with each other but are never allowed to co‑operate to any real extent; the “national” strikes which are found to be supported by “international” money from Moscow and elsewhere. And the intelligent observer will not fail to notice that many men occupying high and responsible positions in the Trades Union and Political Organisations, and even in Ministerial positions, are lending their aid to the subverters of the National life, some of them knowingly and for payment, others in consequence of the extreme vacuity of their political mind. The investigator will not find in the books on Italian Fascism any useful information regarding the prime cause lying behind the movements of the Communists. From other sources, however, we are enabled to explain how it came about that schemes of Government based upon the noble ideas contained in the words, “Liberty, Equality, Fraternity,” have wrecked the world. There is no shortage of wealth in the world; the present is a time of plenty, and the physical and mechanical means for distributing that Plenty are extraordinarily efficient. But the world has become unworkable. Somebody is continually putting on the brake, or throwing sand into the bearings, or interfering with the Works in some sort of way. As there is nothing wrong with the essentials, it must be in one of the auxiliary processes of Industry, Trade or Finance that we shall find the obstruction. A semi‑official account of Italian Fascism will be found in “Survey of Fascism,” the year Book of the International Centre of Fascist Studies, 1928, published by Ernest Benn, Ltd., Bouverie House, Fleet Street, London, .E.C.4. First, however, let us enquire how far and in what respects the Democratic form of government has been responsible for these troubles. That form of government is based on the idea that all men are EQUAL and can be trusted if given full LIBERTY (by means of the Franchise of course), to elect to Parliament men who are capable of upholding the interests of the State, and who are not panderers to the wishes of those outside International wire‑pullers who are for ever trying to destroy the State. As this Democratic form of Government, when put to the test has brought many countries into a condition bordering on chaos, there must be some flaw in the “Equality, Liberty” slogan. We were so astonished at the context of these words that we proceeded to read the whole book. And then? Then there was unfolded to our view not only the evil purpose lying behind the misuse of the words, “Liberty, Equality, Fraternity,” but also the origin of all the world's social, financial and economic troubles. We found from the Protocols that there had been laid down, many centuries ago, an elaborate plot for undermining the power and position of all the Gentile nations so that they might fall into such chaotic con*fusion financially and economically, that they would in sheer despair allow the Jews to take in hand the Super‑government of the world. The Jews seem to have packed into this small space a whole mine of wisdom. How true their comments on the non-existence of Equality! How true their comments on the cruel use to which the slogan of “Liberty” has been put. Is anyone prepared to question their verdict on the folly of nations allowing themselves to be governed by “upstarts” from the mob? After making a close and detailed examination of what they have to say on the other follies of Gentile administration, we must confess ourselves unable to find a single flaw in their statements. Not only are they stating the unadulterated Truth, but they state it in terms replete with wisdom. But we were told by those who recommended this book to us that it had been branded as a forgery by the Jews. What! Is it possible to forge Truth and Wisdom? Our fears were allayed when we discovered that the charge of forgery was fastened not upon the truth or otherwise of the statements made in the book, but upon the source from which that material had been obtained. The question of source need not stand in our way. The source of “The Wisdom of Solomon” is disputed, but that does not prevent us from reading it to our intellectual and spiritual satisfaction. Similarly it is open to everyone to learn Wisdom from the Protocols; they are full of it! 1. The details of the plan by which the Jews are undermining Gentile dominion. 2. The stupidity of the Gentiles which facilitates the progress of the plan and has now brought it to a successful issue. 3. The form of government which the Jews intend to set up when they attain world dominion. These three subjects are intermingled in a series of lectures which taken collectively form a progress report delivered to the Elders of Zion at Basle in 1897, on the occasion of the first Zionist Conference. The lecturer was Theodore Herzl, the then leader of Zionism. He complained, and left it on record, that his communi*cations had not been kept secret. In 1902, copies of some of his lectures were carried into Russia and in 1905 they were published; they were republished in 1917. As regards the details of the plan we must leave the reader to study the Protocols. He can obtain the Marsden edition from us. And there are many other statements of a similar nature, all of which are true and all of which say, in effect, that Democracy lands the distracted State eventually in the hands of the Jews. And thus we see that the argument which we set out to develop against the Democratic form of Government is found to be in full accord*ance with Jewish ideas. We could not have come to a more competent authority. "Out of the economic chaos, the discontent of the Jew evolved organized capital with its working instrumentality, the banking system . . . .
"One of the impressive phenomena of the impressive time is the revolt of the Jew against the Frankenstein which his own mind conceived and his own hand fashioned. . . .
"That achievement (Russian Bolshevik revolution — Ed. ), destined to figure in history as the over-shadowing result of the World War, was largely the outcome of Jewish thinking, of Jewish discontent, of Jewish effort to reconstruct . . . .
"What Jewish idealism and Jewish discontent have so powerfully contributed to accomplish in Russia, the same historic qualities of the Jewish mind and heart are tending to promote in other countries . . . .
"Shall America, like the Russia of the Czars, overwhelm the Jew with the bitter and baseless reproach of being a destroyer, and thus put him in the position of an irreconcilable enemy? "Or shall America avail itself of Jewish genius as it avails itself of the peculiar genius of every other race? . . . .
"That is the question for the American people to answer." — From an article in The American Hebrew, Sept. 10, 1920. The American people will answer that question, and their answer will be against the disruptive genius of dissatisfied Jews. It is very well known that "what Jewish idealism and Jewish discontent have so powerfully contributed to accomplish in Russia" is also being attempted in the United States. Why did not the writer in the American Hebrew say the United States, instead of saying "the same historic qualities of the Jewish mind and heart are tending to promote in other countries." "Jewish idealism and Jewish discontent" are not directed against capital. Capital is enlisted in their service. The only governmental order the Jewish effort is directed against is Gentile governmental order; and the only "capital" it attacks is Gentile capital. "In Eastern Europe Bolshevism and Zionism often seem to grow side by side, just as Jewish influence molded Republican and Socialist thought throughout the nineteenth century down to the Young Turk revolution in Constantinople hardly more than a decade ago — not because the Jew cares for the positive side of radical philosophy, not because he desires to be a partaker in Gentile nationalism or Gentile democracy, but because no existing Gentile system of government is ever anything but distasteful to him." And that analysis is absolutely true. In Russia, the excuse was the czar; in Germany, the kaiser; in England it is the Irish question; in the numerous South American revolutions, where the Jews always had a ruling hand, no particular reason was thought necessary to be given; in the United States it is "the capitalistic class;" but always and everywhere it is, by the confession of their own spokesman, a distaste for any form whatsoever of Gentile government. The Jew believes that the world is his by right; he wants to collect his own, and the speediest way of doing so is the destruction of order by revolution — a destruction which is made possible by a long and clever campaign of loose and destructive ideas. As to the second point, every reader can verify the fact from his own experience. Let him recall to his mind the capitalists who have been held up to public scorn in the Jew-controlled press of the United States — and whom does he find them to be? Whose forms have you seen caricatured with the dollar-mark in Hearst's papers? Are they Seligman, Kahn, Warburg, Schiff, Kuhn, Loeb & Company, or any of the others? No. These are Jewish bankers. The attack is never made on them. The names made most familiar to you by newspaper denunciation are the names of Gentile industrial and banking leaders — and Gentile leaders only — the principal ones being Morgan and Rockefeller. It is a well-known fact that during the French Commune when men of wealth suffered severe losses in property, the Jewish Rothschilds were not injured to the extent of one pennyworth. It is also a well-known fact, capable of proof satisfactory to any ordinary mind, that the connections between Jewish financiers and the more dangerous revolutionary elements here in the United States are such that it is most unlikely that the former stand to lose anything in any event. Under cover of the disorder in Russia at the present time, Jewish financiers are taking advantage of the stress of the people to gain control of all the strategic natural resources and municipal property, by methods which they fully expect to be legalized by Jewish courts when the present "Bolshevik regime" announces that it will give way to a "modified communism." The world hasn't seen the end of Bolshevism yet. Like the World War, Bolshevism cannot be interpreted until it is seen who profits most by it, and the profiteering is in full sway now. The enemy is Gentile capital. Not any other. And "all the wealth of the world is in our hands" is the unspoken slogan of every Jewish outbreak in the world today. The quotation at the head if this article represents the position which the Jews are now ready to take with reference to the Russian Revolution. They have always been charged with responsibility for what has occurred in that unhappy country, but at first their spokesmen denied it. The denials were most indignant, and were usually accompanied by the typical plaint that the charge was "persecution." But the facts have been so overwhelming, and the government investigations have been so revealing, that denials have been abandoned. For a while an attempt was made to distract attention from Russia by a tremendously powerful propaganda concerning the Jews in Poland. There are many indications that the Polish propaganda was undertaken as a "cover" for the immense immigration of Jews into the United States. It may be that some of our readers do not know it, but an endless stream of the most undesirable immigrants pours daily into the United States, tens of thousands of the same people whose presence has been the problem and menace of the governments of Europe. Well, the Polish propaganda and the immigration movement are sailing along smoothly, and the United States Government is assured by the Jewish ring at Washington that everything is quiet along the Potomac (it is quiet there, quiet as the Jewish ring could wish), but still the Russian fact persists in calling for explanation. And here is the explanation: The Jews created capitalism, we are told. But capitalism has proved itself ill-behaved. So now, the Jewish creators are going to destroy their creation. They have done so in Russia. And now, will the American people be good and let their Jewish benefactors do the same in America? That is the new explanation, and typically Jewish again, it is coupled with a proposal for the United States — and a threat! If American refuses this particular service of the Jew, we "put him in a position of an irreconcilable enemy." See quotation at the head of this article. But the Jews have not destroyed capitalism in Russia. When Lenin and Trotsky make their farewell bow and retire under the protective influence of the Jewish capitalists of the world, it will be seen that only Gentile or Russian capital has been destroyed, and that Jewish capital has been enthroned. "Dear Comrade: — The banking house, M. Warburg, opened an account for the enterprise of Comrade Trotsky upon receipt of a telegram from the Chairman of the 'Rhein-Westphalian Syndicate.' A lawyer, probably Mr. Kestroff, obtained ammunition and organized the transportation of same, together with that of the money * * * to whom the sum demanded by Comrade Trotsky is to be handed. Long before that, an American Jewish financier was supplying the funds which carried revolutionary propaganda to thousands of Russian prisoners of war in Japanese camps. It is sometimes said, by way of explaining the Bolshevik movement, that it was financed from Germany, a fact which was seized upon to supply war propaganda. It is true that part of the money came from Germany. It is true that part of the money came from the United States. It is the whole truth that Jewish finance in all the countries was interested in Bolshevism as an All-Jewish investment. For the whole period of the war, the Jewish World Program was cloaked under this or that national name — the blame being laid on the Germans by the Allies, and on the Allies by the Germans, and the people kept in ignorance of who the real personages were. It was stated by a French official that two millions of money was contributed by one Jewish banker alone. When Trotsky left the United States to fulfill his appointed task, he was released from arrest at Halifax upon request of the United States, and everyone knows who constituted the War Government of the United States. The conclusion, when all the facts are considered, is irresistible, that the Bolshevik revolution was a carefully groomed investment on the part of International Jewish Finance. It is easy to understand, then, why the same forces would like to introduce it to the United States. The real struggle in this country is not between labor and capital; the real struggle is between Jewish capital and Gentile capital, with the I.W.W. leaders, the Socialist leaders, the Red leaders, and the labor leaders almost a unit on the side of the Jewish capitalists. Again recall which financiers these men most attack. You cannot recall a single Jewish name. The main purpose in these two articles, however, is to introduce the Jewish testimony which exists as to the Jewish nature of Bolshevism. "There is much in the fact of Bolshevism itself, in the fact that so many Jews are Bolsheviks, in the fact that the ideals of Bolshevism at many points are consonant with the finest ideals of Judaism." In the same paper, of 1920, is a report of an address made by Israel Zangwill, a noted Jewish writer, in which he pronounced glowing praise on "the race which has produced a Beaconsfield, a Reading, a Montagu, a Klotz, a Kurt Eisner, a Trotsky." Mr. Zangwill, in his swelling Semitic enthusiasm, embraced the Jews in the British Government in the same category with the Jews of the Hungarian and Russian Bolshevik governments. What is the difference? They are all Jewish, and all of equal honor and usefulness to "the race." "When the Jew gives his thought, his devotion, to the cause of the workers and of the dispossessed, of the disinherited of the world, the radical quality within him goes to the roots of things, and in Germany he becomes a Marx and a Lassalle, a Haas and an Edward Bernstein; in Austria he becomes a Victor Adler and a Friedrich Adler; in Russia, a Trotsky. Just take for a moment the present situation in Russia and in Germany. The revolution set creative forces free, and see what a large company of Jews was available for immediate service. Socialist Revolutionaries and Mensheviki, and Bolsheviki, Majority and Minority Socialists — whatever they be called — Jews are to be found among the trusted leaders and the routine workers of all these revolutionary parties." "See," says the rabbi, "what a large company of Jews are available for immediate service." One ought to see where he points. There are as many Jewish members of revolutionary societies in the United States, as there were in Russia; and here, as there, they are "available for immediate service." "The Jew, therefore, does take a part in revolutions, and he participates in them in so far as he is a Jew, or more correctly, in so far as he remains a Jew." He says also — "The Jewish spirit is essentially a revolutionary spirit, and consciously or otherwise, the Jew is a revolutionist." There is hardly any country in the world, except the United States, where denials of this could be made in such a way as to require proof. In every other country the fact is known. Here we have been under such a fear of mentioning the word "Jew" or anything pertaining to it, that the commonest facts have been kept from us — facts which even a superficial knowledge of Jewish writing would have given us. It was almost a pathetic spectacle to see American audiences go to lectures about the Russian situation and come away from the hall confused and perplexed because the Russian situation is so un-Russian, all because no lecturer thought it politic to mention "Jew" in the United States, for, as some day we shall see, the Jew has contrived to gain control of the platform too. Not only do the literary lights of Jewry acknowledge the Jew's propensity to revolution generally, and his responsibility for the Russian situation particularly, but the lower lights also have a very clear idea about it. The Jew in the midst of the revolution is conscious that somehow he is advancing the cause of Israel. He may be a "bad Jew" in the synagogue sense, but he is enough of a Jew to be willing to do any thing that would advance the prestige of Israel. Race is stronger than religion in Jewry. "It should not be forgotten that the Jewish people, who for centuries were oppressed by kings and czars, are the real proletariat, the real Internationale, which has no country." "Without exaggeration, it may be said that the great Russian social revolution was indeed accomplished by the hands of the Jews. Would the dark, oppressed masses of the Russian workmen and peasants have been able to throw off the yoke of the bourgeoisie by themselves? No, it was precisely the Jews who led the Russian proletariat to the dawn of the Internationale and not only have led, but are also now leading the Soviet cause which remains in their safe hands. We may be quiet as long as the chief command of the Red Army is in the hands of Comrade Leon Trotsky. It is true that there are no Jews in the ranks of the Red Army as far as privates are concerned, but in the committees and Soviet organizations, as commissars, the Jews are gallantly leading the masses of the Russian proletariat to victory. It is not without reason that during the elections to all Soviet institutions the Jews are winning by an overwhelming majority * * * The symbol of Jewry, which for centuries has struggled against capitalism, has become also the symbol of the Russian proletariat, which can be seen even in the adoption of the Red five-pointed star, which in former times, as it is well known, was the symbol of Zionism and Jewry. With this sign comes victory, with this sign comes the death of the parasites of the bourgeoisie * * * Jewish tears will come out of them in sweat of drops of blood." This confession, or rather boast, is remarkable for its completeness. The Jews, says Mr. Cohan, are in control of the Russian masses — the Russian masses who have never risen at all, who only know that a minority, like the czar's minority, is in control at the seat of government. The Jews are not in the Red Army, Mr. Cohan informs us, that is, in the ranks where the actual fighting is done; and this is strictly in line with the Protocols. The strategy of the World Program is to set Gentiles to kill Gentiles. This was the Jewish boast during the various French social disasters, that so many Frenchmen had been set killing each other. In the World War just passed, there were as many Gentiles killed by Gentiles as there are Jews in the world. It was a great victory for Israel. "Jewish tears will come out of them in sweat of drops of blood." But the Jews are in the places of control and safety, says Mr. Cohan, and he is absolutely right about it. The wonder is that he was so honest as to say it. As to the elections, so-called, at which the Jews are so unanimously chosen, the literature of Bolshevism is very explicit. Those who voted against the Jewish candidates were adjudged "enemies of the revolution" and executed. It did not require many executions at a voting place to make all the elections unanimous. Mr. Cohan is especially instructive on the significance of the Red Star, the five-pointed emblem of Bolshevism. "The symbol of Jewry," he says, "has become also the symbol of the Russian proletariat." The Star of David, the Jewish national emblem, is a six-pointed Star, formed by two triangles, one standing on its base, the other on its apex. Deprived of their base lines, these triangles approximate the familiar Masonic emblem of the Square and Compass. It is this Star of David of which a Jewish observer in Palestine remarks that there are so few among the graves of the British solders who won Palestine in the recent war; most of the signs are the familiar wooden Cross. These Crosses are now reported to be objectionable to the new rulers of Palestine, because they are so plainly in view of the visitor who approaches the new Jewish university. As in Soviet Russia, so in Palestine, not many Jews laid down their lives for the cause: there were plenty of Gentiles for that purpose. As the Jew is a past master in the art of symbolism, it may not be without significance that the Bolshevik Star has one point less than the Star of David. For there is still one point to be fulfilled in the World Program as outlined in the Protocols — and that is the enthronement of "our leader." When he comes, the World Autocrat for whom the whole program is framed, the sixth point may be added. The Five Points of the Star now apparently assured are the Purse, the Press, the Peerage, Palestine and Proletarianism. The sixth point will be the Prince of Israel. It is very hard to say, it is hard to believe, but Mr. Cohan has said it, and revolutions especially since the French Revolution confirm it, that "with this sign comes the death of the parasites of the bourgeoisie * * * Jewish tears will come out of them in sweat of drops of blood." The "bourgeoisie," as the Protocols say, are always Gentile. The common counterargument to the invincible fact of the Jewish character of the Russian revolution — an argument which is destined to disappear now that Jewish acknowledgement is coming thick and fast — is that the Jews in Russia suffer too. "How can we favor a movement which makes our own people suffer?" is the argument put up to the Gentile. Well, the fact is this: they are favoring that movement. Today, this very moment, the Bolshevik Government is receiving money from Jewish financiers in Europe, and if in Europe, then of course from the International Jewish bankers in America also. That is one fact. Another fact is this: the Jews of Russia are not suffering to anywhere near the extent we are told by the propagandists. It is now a fact admitted by Jews themselves that upon the first sweep of the Bolshevists across Poland, the Polish Jews were friendly with the invaders and helped them. The fact was explained by American Jews in this manner: since Bolshevism came to Russia, the condition of the Jews there has greatly improved — therefore the Polish Jews were friendly. And it is true — the condition of Russian Jews is good. One reason is: they have Russia. Everything there belongs to them. The other reason is: The Jews of Russia are the only ones receiving help there today. Did that second statement ever strike you as significant? Only the Jews of Russia have food and money sent to them. It is one form, of course, of the support which the Jewish world is giving Bolshevism. But if the suffering among the Jews is what the propagandists say it is, what must it be among the Russians? Yet no one is sending food or money to them. The probable truth of the whole situation is that Jewish Bolshevism is laying a tax on the world. Any time it may be required, there is plenty of evidence as to the good condition of the Jews in Russia. They have all there is. Another source of confusion is revealed in the question: "How can Jewish capitalists support Bolshevism when Bolshevism is against capitalism?" Bolshevism, as before stated, is only against Gentile Capitalism. Jewish financiers who remained in Russia are very useful to the Bolsheviki. Read this description by an eyewitness: "A Jew is this Commissary of the Bank, very elegant, with a cravat of the latest style, and a fancy waistcoat. A Jew is this District Commissary, former stockbroker, with a double bourgeois chin. Again a Jew, this inspector of taxes: he understands perfectly how to squeeze the bourgeoisie." These agents of Jewry are still there. Other agents are among the Russians who fled, getting their lands away from them on mortgage loans. When the curtain lifts, most of the choice real estate will be found to have passed into Jewish control by perfectly "legal" means. That is one answer to the question, Why the Jewish capitalists support Bolshevism. The Red Revolution is the greatest speculative event of human history. Besides, it is for the exaltation of Israel; it is a colossal revenge, which the Jews always take where they can, for wrongs real or imaginary. Jewish capitalism knows exactly what it is doing. What are its gains? It has taken a whole rich country, without the cost of war. It has demonstrated the necessity of gold. Jewish power rests on the fiction that gold is wealth. By the premeditated clumsiness of the Bolshevik monetary system, the unthinking world has been made to believe still more strongly that gold is necessary, and this belief gives Jewish capitalism another hold on the Gentile world. If the Bolshevists had been honest, they could have dealt Jewish capitalism its death blow. No! Gold is still on the throne. Destroy the fiction that gold has value, and you leave the Jewish International Financiers sitting forlorn on heaps of useless metal. It has demonstrated its power to the world. Protocol Seven says: "To demonstrate our enslavement of the Gentile governments of Europe, we will show our power to one of them by crimes of violence, that is, a reign of terror." Has Europe been sufficiently "shown"? Europe has, and is afraid! That is a great gain for Jewish capitalists. Not the least of the gains is the field practice in the art of revolution which Russia has offered. Students of that Red school are coming back to the United States. The technique of revolution has been reduced to a science according to the details laid down in the Protocols. To use Rabbi Magnes's words again: "See what a large company of Jews was available for immediate service." The available company is now much larger. If nazism is the same as communism, it follows that nazism is also jewish? It is simply collectivism freed from all traces of an individualist tradition which might hamper its realization. . .
Perhaps the first, and in some ways the most characteristic, representative of this development is the late Professor Werner Sombart, whose notorious Handler und Helden (“Merchants.and Heroes") appeared in 1915. Sombart had begun as a Marxian socialist and, as late as 1909, could assert with pride that he had devoted the greater part of his life to fighting for the ideas of Karl Marx. He had done as much any man to spread socialist ideas and anticapitalist resentment of varying shades throughout Germany; and if German thought became penetrated with Marxian elements in a way that was true of no other country until the Russian revolution, this was in a large measure due to Sombart. At one time he was regarded as the outstanding representative of the persecuted socialist intelligentsia, unable, because of his radical views, to obtain a university chair. And even after the last war the influence, inside and outside Germany, of his work as a historian, which remained Marxist in approach after he had ceased to be a Marxist in politics, was most extensive and is particularly noticeable in the works of many of the English and American planners. . . If Sombart's outburst was at the time too much even for most Germans, another German professor arrived at essentially the same ideas in a more moderate and more scholarly, but for that reason even more effective, form. Professor Johann Plenge was as great an authority on Marx as Sombart. His book on Marx und Hegel marks the beginning of the modern Hegel renaissance among Marxian scholars; and there can be no doubt about the genuinely socialist nature of the convictions with which he started. Among his numerous war publications the most important is a small but at the time widely discussed book with the significant title, 1789 and 1914: The Symbolic Years in the History of the Political Mind. It is devoted to the conflict between the "Ideas of 1789," the ideal of freedom, and the "Ideas of 1914," the ideal of organization. . .
Ideas very similar to these were current in the offices of the German raw-material dictator, Walter Rathenau [JEW], who, although he would have shuddered had he realized the consequences of his totalitarian economics, yet deserves a considerable place in any fuller history of the growth of Nazi ideas. Through his writings he has probably, more than any other man, determined the economic views of the generation which grew up in Germany during and immediately after the last war; and some of his closest collaborators were later to form the backbone of the staff of Goring's Five-Year Plan administration. Very similar also was much of the teaching of another former Marxist, Friedrich Naumann, whose Mitteleuropa reached probably the greatest circulation of any war book in Germany. . .
Jewish NKVD Murder Polish Elite (Part 1of2) Katyn Forest Massacre Original Foootage.